Posted 12:02 am by Jonny Pigg & filed under Gig. Saltburn‘s social justice party starter‘s return on Saturday 19th October for another special night as part of Global Frackdown Day. The event will be in the main lounge of the Marine Saltburn and will run from 7.30pm till late and as ever is completely free. Global Frackdown Day is a national event raising awareness of the dangers of extreme energy and standing against fracking anywhere in the world. Dispelling the myths and looking at renewables as a real option. The night will be in support of national and local campaign groups who are campaigning against these hazadous forms of energy extraction such as ‘Frack off’ and ‘Frack Free Cleveland’. 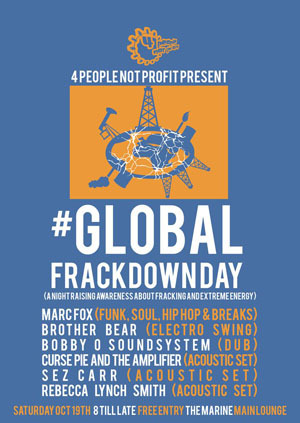 So tell all your friends and family and get down and don’t forget to bring your dancing shoes and get ready to boogie in support of Global Frackdown Day with 4 People Not Profit!